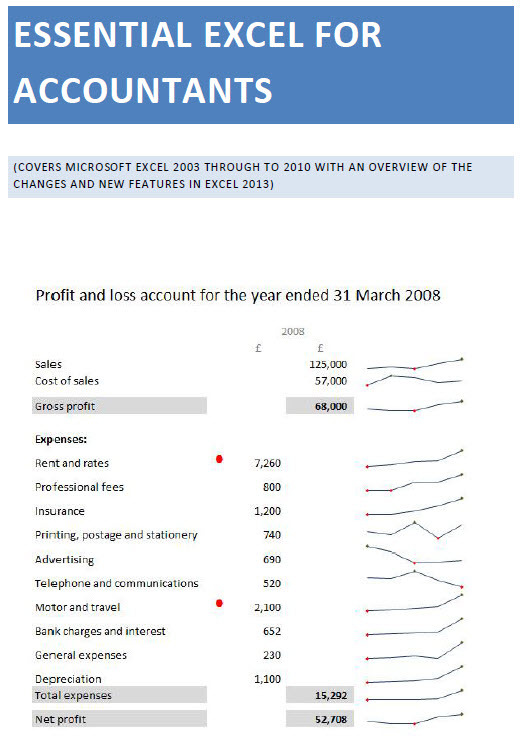 Excel 2010 - Do Slicers cut it? 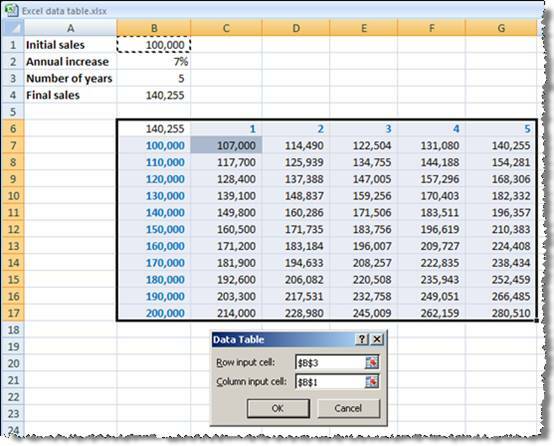 Lists and tables: Excel's most underrated feature? 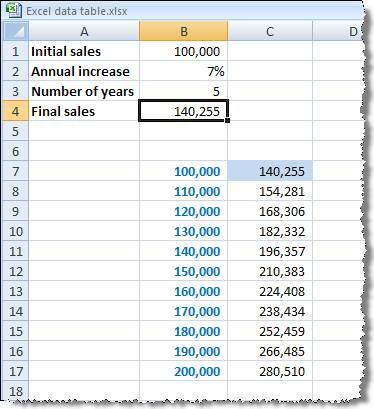 This is a relatively unknown and little used feature in Excel, but can be very useful where you need to compare a range of possible inputs into a calculation. There are two types of data table: a 'one-way' table that allows several alternatives for a single input to be compared, and a 'two-way' table that caters for two changing inputs. As we said earlier, we can have one-way or two-way data tables. 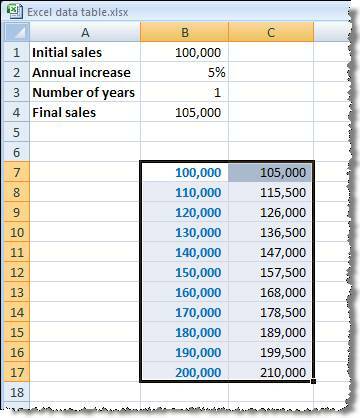 Let's assume that in our case we want to create a table that not only shows the final sales value for different initial sales values, but also shows the different values for different numbers of years. 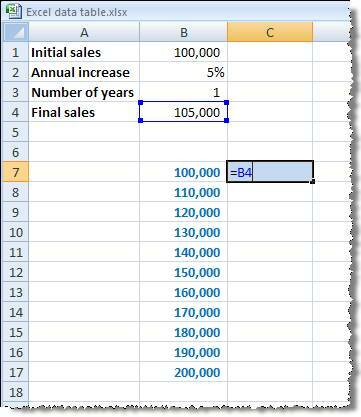 To do this we can start with our one-way data table but instead of entering the reference to the formula to the right of the first value in our table, we enter it in the cell immediately above the first value (B6). We then enter our different numbers of years to the right of the formula cell (say C6:G6). 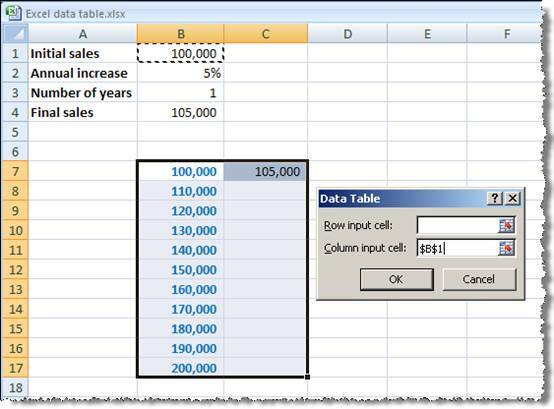 Then select the entire table from the formula cell at the top left hand corner. Again we use the Data Table option, but this time we need to enter a 'Row input cell' as well as a 'Column input cell'.